The codebases parameter is only used to fill in missing details about a codebases when scheduling a build. For example, when a change to codebase A occurs, a scheduler must invent a sourcestamp for codebase B. The parameter does not act as a filter on incoming changes -- use a change filter for that purpose. There is currently no mechanism to control which master's scheduler instance becomes active. The behavior is nondeterministic, based on the timing of polling by inactive schedulers. The failover is non-revertive. the branch on which this change occurred. Note that 'trunk' or 'master' is often denoted by None. The codebases argument will filter out codebases not specified there, but won't filter based on the branches specified there. If treeStableTimer is not set, then this scheduler is indistinguishable from bb:sched:SingleBranchScheduler. If treeStableTimer is set, then a build is triggered for each set of Changes which arrive within the configured time, and match the filters. It is common to wind up with one kind of build which should only be performed if the same source code was successfully handled by some other kind of build first. An example might be a packaging step: you might only want to produce .deb or RPM packages from a tree that was known to compile successfully and pass all unit tests. You could put the packaging step in the same Build as the compile and testing steps, but there might be other reasons to not do this (in particular you might have several Builders worth of compiles/tests, but only wish to do the packaging once). Another example is if you want to skip the full builds after a failing quick build of the same source code. Or, if one Build creates a product (like a compiled library) that is used by some other Builder, you'd want to make sure the consuming Build is run after the producing one. You can use dependencies to express this relationship to the Buildbot. There is a special kind of scheduler named Dependent that will watch an upstream scheduler for builds to complete successfully (on all of its Builders). Each time that happens, the same source code (i.e. the same SourceStamp) will be used to start a new set of builds, on a different set of Builders. This downstream scheduler doesn't pay attention to Changes at all. It only pays attention to the upstream scheduler. The buildmaster must have a scheduler instance in the config file's schedulers list to receive try requests. This lets the administrator control who may initiate these trial builds, which branches are eligible for trial builds, and which Builders should be used for them. The scheduler has various means to accept build requests. All of them enforce more security than the usual buildmaster ports do. Any source code being built can be used to compromise the worker accounts, but in general that code must be checked out from the VC repository first, so only people with commit privileges can get control of the workers. The usual force-build control channels can waste worker time but do not allow arbitrary commands to be executed by people who don't have those commit privileges. However, the source code patch that is provided with the trial build does not have to go through the VC system first, so it is important to make sure these builds cannot be abused by a non-committer to acquire as much control over the workers as a committer has. Ideally, only developers who have commit access to the VC repository would be able to start trial builds, but unfortunately the buildmaster does not, in general, have access to VC system's user list. This approach creates a command queue directory, called the jobdir, in the buildmaster's working directory. The buildmaster admin sets the ownership and permissions of this directory to only grant write access to the desired set of developers, all of whom must have accounts on the machine. The buildbot try command creates a special file containing the source stamp information and drops it in the jobdir, just like a standard maildir. When the buildmaster notices the new file, it unpacks the information inside and starts the builds. The config file entries used by 'buildbot try' either specify a local queuedir (for which write and mv are used) or a remote one (using scp and ssh). In this approach, each developer gets a username/password pair, which are all listed in the buildmaster's configuration file. When the developer runs buildbot try, their machine connects to the buildmaster via PB and authenticates themselves using that username and password, then sends a PB command to start the trial build. The advantage of this scheme is that the entire configuration is performed inside the buildmaster's config file. The disadvantages are that it is less secure (while the cred authentication system does not expose the password in plaintext over the wire, it does not offer most of the other security properties that SSH does). In addition, the buildmaster admin is responsible for maintaining the username/password list, adding and deleting entries as developers come and go. The Triggerable scheduler waits to be triggered by a Trigger step (see Triggering Schedulers) in another build. That step can optionally wait for the scheduler's builds to complete. This provides two advantages over Dependent schedulers. First, the same scheduler can be triggered from multiple builds. Second, the ability to wait for Triggerable's builds to complete provides a form of "subroutine call", where one or more builds can "call" a scheduler to perform some work for them, perhaps on other workers. The Triggerable scheduler supports multiple codebases. The scheduler filters out all codebases from Trigger steps that are not configured in the scheduler. A parameter allowing the user to specify the reason for the build. The default value is a string parameter with a default value "force build". A list of strings or CodebaseParameter specifying the codebases that should be presented. The default is a single codebase with no name (i.e. codebases=[''] ). A list of parameters, one for each property. These can be arbitrary parameters, where the parameter's name is taken as the property name, or AnyPropertyParameter, which allows the web user to specify the property name. The default value is an empty list. 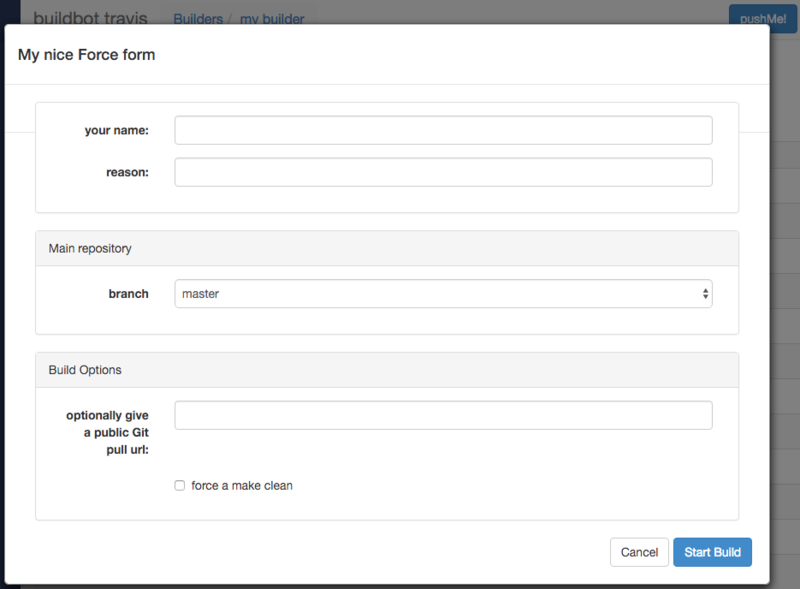 The name of the "submit" button on the resulting force-build form. This defaults to the name of scheduler. Most of the arguments to ForceScheduler are "parameters". Several classes of parameters are available, each describing a different kind of input from a force-build form. This can be used to declare complex build forms which won't fit into one screen. The children fields are usually other NestedParameters with vertical layout. Note that for some use cases, the choices need to be generated dynamically. This can be done via subclassing and overriding the 'getChoices' member function. An example of this is provided by the source for the InheritBuildParameter class. If true, verify that the user's input is from the list. Note that this only affects the validation of the form request; even if this argument is False, there is no HTML form component available to enter an arbitrary value.